That is that I found in the bag after night ride on the train in India. The photo camera bag was empty. 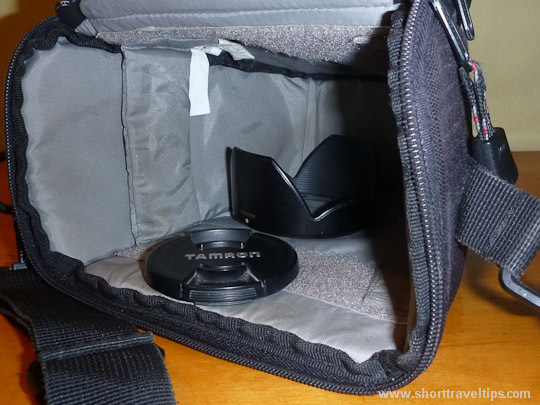 Only lens cap and hood left and my beloved Canon 20D and Tamron 18-50 lens were gone. I even don’t know when it did happen. My large backpack was chained to the bedpost and another small day pack with camera bag inside I was keeping beside my head in the bed. The train arrived to the destination very early. I checked my bed for any my stuff I could leave and got out of the train. The hour later I opened my day pack and saw empty camera case. What?!?! During night I did left a bag for a couple minutes, other time the bag was always with me. I can say only one word – incredible. How did somebody managed to steal it? Nobody could believe it can happen in India, but it did…This camera probably three or maybe even four times traveled around the world with me. It is quit old Canon camera and had a lot of wear signs, so it didn’t have much value. Not the camera and lens were biggest lost. I lost flash card with all pictures from my journey to Sri Lanka. The rest of day I spent in police office. Everybody was very nice, but of course nobody could promise anything and I didn’t have much hope. Actually I didn’t have any hope to recover my camera with my photos. Are there any travel insurance which covers stolen items? Of course if won’t restore images, but at least it would be possible to buy another camera. Let me know if you know such insurance coverage. It’s actually one of the big dilemma that the tourism agency of India suffers knowing how the tourist evade the country because of these incredible thieves. You have to be so careful. If there is some item that means something to you, like a camera, keep it on your possession at all costs. It’s a downside to visiting the country alright but i think it’s still worth it: incredible spirit in many of the people. Its really sad that you lost your camera, but top being Judgmental, and stop defaming India. Thief are everywhere not in India only, Stop making propaganda out of it, I request you politely to do a little R & D about India, You will Learn about rich heritage and beautiful insights about India. Sumit, what propaganda you are talking about? I am just sharing my experience and it is not always the best. Btw in each country I visit I want to see real life but not just tourism highlights and I saw India as very poor country, so I am not surprised it did happen to me in India. Not quite sure what sumit is talking about. thanks Wftristan, I will check it. So sorry to hear this, if you are going to make a claim on insurance make sure you get a police report. As someone who has been robbed many times, I have always had to show one. Ayngelina, what insurance are you using? Because the travel insurance I had didn’t cover any stolen items. Sorry to hear that. Even though I am from India it really surprises me. I had my smart phone stolen on a train too. i think i fell asleep for 15 minutes and it was gone. There was no way of knowing who took it. Since then I cling to my bag like a monkey. Hi, sorry to note that your camera was stolen. All that I can say is that theft is something that happens everywhere, not only in India. And of course, India must be poor but it did have a rich heritage and past which attracted England here & you know what they did, I need not elaborate. I am not telling it happens only in India. Of course it can happen almost in any country. But I was surprised how it happened that night on the train.